Robinson's Ferry and a little about the lake. This marker is on the way to New Melones Reservoir and is situated just before you cross the lake right before the Tuttletown access road. The inscription reads: In 1848 John W. Robinson and Stephen Mead established ferry transport for freight animals and persons across the river. In 1856 Harvey Wood purchased interest and later acquired property which was maintained by the Wood Family until 1911. Charges were 50 cents for each passenger, horse, Jenny, or other animal. The ferry was used to cross the Stanislaus River. 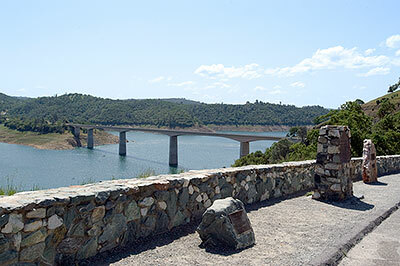 Now a bridge spans that area and is part of New Melones Reservoir. See below. Here is a picture courtesy of the California Historical Society Collection of the University of Southern California. Photograph of a view of Robinson's Ferry landing at the Stanislaus River in Melones, ca.1930. A wooden bridge extends from the dirt bank in the foreground to the other side of the riverbed. At the edge of the plank in center a staircase leads down to the ground through a wooden frame. At the bottom of the stairs there is a small trail of sunshine that is allowed through the shade that the tall trees on the right provide. A bend of the river can be seen on the left with banks of dirt and weeds. A hillside covered in trees and bushes can be seen in the background. "Ferry began operation in 1849 but is no longer used as the river has changed its course and a bridge has been built". The original dam was built in 1926 and a larger dam was completed in 1980. The lake was specifically designed to prevent floods and to establish a hydroelectric power plant. New Melones Dam was not without its controversies, and was fiercely opposed by groups such as the Sierra Club and individuals – especially river runners – who saw the Stanislaus River canyon as having greater value than a reservoir. Another cause of concern was the unique ecology of the canyon, which included endemic species such as Banksula melones, the Melones cave harvestman (A minute troglobitic harvestman; body yellowish-orange, appendages white to yellowish white.). The controversy raged in courts for years, culminating on May 20, 1979, as New Melones Lake was already rising. On that day, Friends of the River founder Mark Dubois hiked into the reservoir site and chained himself to a boulder, forcing the USACE to either stop filling the lake or to drown him. Dubois's actions won a temporary reprieve for the river above Parrott's Ferry Bridge, as the California State Water Resources Control Board set the limit for lake level at 844 ft (257 m) above sea level, corresponding to a storage capacity of 438,000 acre·ft (540,000 dam3). However, in 1982 a record snowmelt combined with heavy rains caused the Stanislaus River to flow into the reservoir at a rate much higher than it could be released from the dam. The water level passed the state limit on January 15 and by early 1983, the water had risen so high that it crested the dam's emergency spillway. In March 1983, the state lifted its original restriction on New Melones lake level. Nevertheless, the controversy over the dam greatly strengthened the environmental movement in California, and very few new large dams have been built in the state since New Melones. Hope I didn't give you too much information. I love the history lesson Mark. Do they give tours into the bowels of the dam like they do at Hoover Dam? I've not been able to find any info on tours. They do have a visitors center (where I got my Geezer Pass) and museum, but that's about it.